Freewriting can help you identify writing topics. Plus, it can help you collect details and reflect on your thoughts and feelings. Your Turn Follow these instructions to get started freewriting. 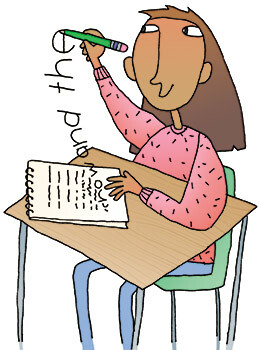 Begin writing about the general subject you are studying. Write about your subject as long as you can, exploring ideas, even goofy ones. Keep writing even when you can't think of anything. Write "l'm stuck but I'm just going to keep going until I come up with something else to write about . . ." until another idea comes to mind. Do not stop to make changes. Afterward, review your writing and underline ideas that you could use as specific topics. Freewriting for Writing Topics by Thoughtful Learning is licensed under a Creative Commons Attribution-NonCommercial-ShareAlike 4.0 International License. Based on a work at k12.thoughtfullearning.com/minilesson/freewriting-writing-topics.